Like most of the other middle-class kids at my junior high, I wore metal braces from the age of 12–14, at which point I graduated to a part-time retainer and a mouth full of straight teeth. It felt like a rite of passage, and both the nerds and the cool kids in school went through orthodontia together. However, unlike most of the other middle-class kids at my junior high, I also wore metal braces from the age of 22–24. Turns out it feels way less cool to wear braces as an adult. So how did I get there? Well, after eight years of straight teeth bliss, I began to suffer from serious jaw pain. I figured it probably had something to do with stress over my impending graduation from college and the existential angst that accompanied any thoughts about my future. While I still had dental and health insurance through my parents’ plan, I made an appointment with my old orthodontist, figuring she’d give me a night guard that would keep me from grinding my teeth too much and send me on my merry way. Nope. Instead, she looked at my mouth for about two seconds and realized that my jaw was seriously screwed up, and the only way to get it back into proper alignment was going to be a delightful combination of braces and jaw surgery. Which is how, at 22, fresh out of college and starting my first real adult job, I had to get braces put on my teeth for the second time and wear them for almost two years. One of the questions I heard most often was “Your teeth are so straight, so why do you need braces?” It turned out that while my teeth were still admirably straight from the first round of orthodontia, my jaw had changed so much that I had developed what is called an open bite. 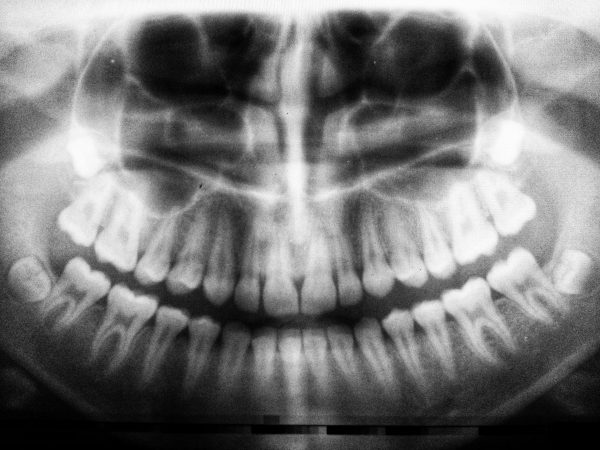 This meant that when I bit down, my teeth only met in the very back of my mouth, along my last top and bottom molars. When teeth are properly aligned, the front upper teeth fit slightly over the lower teeth, and every molar fits into its partner to work together to chew food. This distributes the force of chewing so that each tooth bears weight. When you have an open bite, like I did, only the teeth that touch are bearing that weight, which is what was causing my jaw pain. In extreme cases like mine, surgery is the only way to correct it, and you have to wear braces to help stabilize your teeth and mouth in the lead up to and during recovery from surgery. The second question I heard over and over was “What happens if you don’t correct it?” Believe me, this was my initial plan of action as well. I’d been chewing food successfully for a long time, so why bother correcting this bite issue with a painful-sounding jaw surgery, right? Wrong. It turns out that if I didn’t get my bite reset, I would quickly wear down through the enamel on the teeth that actually touched, and they’d become so damaged I’d have to get them pulled out, at which point I’d start wearing through the next teeth that could fit together, and so on. Considering I was only 22, if I opted not to have surgery I was looking at decades of jaw pain and broken teeth. Jaw surgery was the answer. Although I could enroll in a basic health insurance plan through my employer, I was fortunate enough to be able to stay on my parents’ dental and health insurance, which actually offered better coverage. The wonderful people in the billing department at my oral surgeon’s office also really went to bat for my case with the insurance company, getting it declared medically necessary, which meant insurance mostly covered the cost of the braces, surgery, and hospital stay. It could have been much, much more expensive had I not had access to good, affordable health insurance. I quickly realized a few things during my adventure with adult braces. First off, I learned that it is very foolish to delay checkups, wellness visits, and routine maintenance. I had kind of ignored my dental health during college, skipping regular cleanings because it seemed like a hassle that I couldn’t be bothered with, which meant that I had to get several small cavities filled before I could even start with braces. This delayed everything about six months and was more expensive and painful than it needed to be. If I’d just used the dental insurance my parents were paying for all those years, I could have happily skipped the months of maintenance needed to get my teeth ready for orthodontia. You know that Benjamin Franklin quote “an ounce of prevention is worth a pound of cure”? Turns out preventative care is much easier and less costly than undoing years of neglect. Be ye not so foolish. Second, I learned that people love to comment on other people’s physical appearance. I’m only about five feet tall, so with the addition of braces I looked younger than 22, which men especially commented on all the time. I could hardly attend a meeting or work event without someone saying something along the lines of “You don’t look old enough to have a full-time job” or “Did you graduate from college when you were 12?” I was also told, many times, that I should be flattered and these kinds of comments were compliments so I should enjoy it while I could. Because all women can care about is looking younger, right? While I did learn to *deal with it* and not take these remarks so seriously, I also vowed that going forward I would stop commenting on people’s physical appearances, instead focusing my small talk on things like hobbies and interests. Finally, being sick is expensive and awful. I had healthcare and the support of my parents and it still makes me uncomfortable to think about the total bill for this two-year endeavor. While the jaw surgery was technically elective, it still required a stint in the hospital, was unbelievably painful, and had a long recovery time. At the risk of sounding like Captain Obvious, the healthcare system in our country is complicated, expensive, and seemingly designed to screw over anyone who has the misfortune of getting sick, hurt, or who has the audacity to be born with a preexisting condition. During my two-night hospital stay I saw other patients who were much worse off than me, many through no fault of their own. Obviously, you can’t control when health issues crop up. However, after that experience, I decided I was going to do anything I could to avoid being that incapacitated again, such as eating healthily, exercising, going to the damn dentist regularly, and using the insurance I was fortunate enough to have. A grant writer and personal finance fanatic, Marisa Bell-Metereau is an avid traveler who lives in Pittsburgh, PA. When she’s not reading or writing for work or play, she enjoys running, thrifting, and searching for the most authentic Mexican food in the city. Photo by Umanoide on Unsplash.